You probably know about the damage the sun's ultraviolet (UV) radiation can do to your skin. But do you know about the damage UV radiation does to the eye? This UV exposure adds up over time: The exposure while on the beach as a child combines with sun exposure as you age, resulting in damage later in life. UV light stands for Ultraviolet light. On the light spectrum, violet is the shortest wavelength of visible light – however, ultraviolet light has even shorter wavelengths. The three types of UV radiation are UV-A, UV-B, and UV-C. UV-C rays are absorbed by the ozone layer marking them harmless. Conversely, UV-A and UV-B rays cause permanent impairment to the eyes and can damage vision. UV light in moderation and with proper care can actually improve health. When skin is exposed to UV light, Vitamin D is developed and helpful in fighting diseases such as depression. UV light is important to fight the lack of Vitamin D and is therefore necessary to maintain good health. However, exposure to sunlight in long duration can damage the skin. UV-A and UV-B rays can burn the skin and increase the production of melanin. These UV rays can damage the eye in similar ways. Photokeratitis is a condition where the eyes are “sunburned,” causing agonizing and uncomfortable symptoms for a short period of time. Albeit short lengths of time may cause temporary symptoms, longer duration of exposure can lead to permanent damage such as macular degeneration and cataracts just to name a few. The rays that pass through the pupil of the eye are absorbed by the lens of the eye. This UV radiation may cause cataracts in the lens of the eye. Solar radiation that reaches the surface of the eye is focused and concentrated by the cornea, the clear outermost layer of the eye. Studies show that this UV radiation, which can reach the eyes from above, below and the sides, may cause changes to the tissue on the opposite side of the eye. Small tissue elevations, called pingueculea and pterygia, may result. The American Optometric Association (AOA) recommends the use of sunglasses that block 100 percent of UV-A and UV-B rays to protect the eyes from this radiation. However, many sunglasses styles do not protect the eyes from the solar radiation entering from the sides or around sunglasses. How often do you wear sunglasses to protect from UV damage? Some contact lenses offer additional protection. These contact lenses absorb UV radiation by reducing the amount of radiation that reaches the surface of eye. 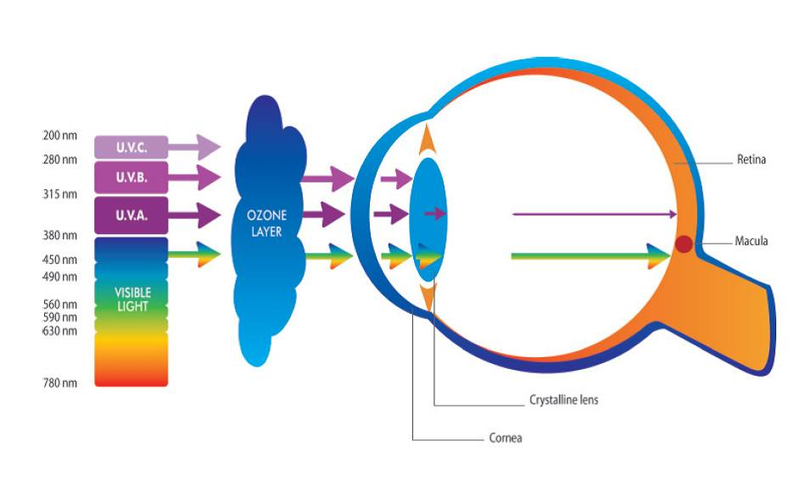 The contact lenses also protect the eye from the radiation that comes from above or around the sides of sunglasses. People who wear contact lenses and do not wear wrap-style sunglasses can further protect themselves from UV radiation by wearing contact lenses that block UV. Talk to your optometrist about your outdoor activities in all seasons so he or she can help identify your risk of UV exposure and the appropriate protection. WARNING: UV-absorbing contact lenses are NOT substitutes for protective UV-absorbing eye wear such as UV-absorbing goggles or sunglasses because they do not completely cover the eye and surrounding area. You should continue to use UV-absorbing eye wear as directed. NOTE: Long-term exposure to UV radiation is one of the risk factors associated with cataracts. Consult your eye care practitioner for more information. Newer PostWhy Do Glasses Have a Prop 65 Warning in California? Older PostHow Bad Is It to Lick Your Contact, Then Put It Back In?